It’s finally here! The 2014 Kansas high school football season begins this week and with it comes the Kpreps.com Top 5 rankings. There are several new storylines this season, including new classifications as a result of the division of Class 4A into 4A Division I (4A-I) and Division II (4A-II). As always, our Kpreps rankings are a collaborative effort from multiple media sources across the state and will be released each Monday throughout the season. So let’s take a look at the preseason rankings for each classification. Olathe North is the top team in Class 6A to begin the season. The Eagles return 18 total starters from last year’s 8-4 team that reached the state semifinals before falling to Shawnee Mission East, 37-27. Olathe North has plenty of star power returning as several players are receiving FBS recruiting attention. Speaking of SM East, the Lancers begin the year ranked No. 2 after their magical run to the 6A title game a year ago. Dustin Delaney’s crew returns 16 starters and should be a major factor in the 6A title race. Defending 5A champion Blue Valley move up a class and begins the year ranked No. 3. The Tigers return one of the state’s top players in offensive lineman A. J. Harris, who has committed to Missouri. Rounding out the top five in 6A is defending champion Derby at No. 4 and Topeka High at No. 5. Derby returns just two starters from last season’s title team, but the Panthers still have enough talent to challenge. Meanwhile, Topeka High returns standout quarterback Alec Beatty who combined for nearly 3,000 yards of total offense a season ago. Bishop Carroll starts out the new season as the top-ranked team in Class 5A. The Eagles return 16 total starters from a season ago. Carroll began 2013 with ten straight wins before a 21-19 quarterfinal loss to Salina South snapped the Eagles’ 23-game winning streak. Wichita Heights drops down from Class 6A and begins the season ranked No. 2. The Falcons return a strong backfield trio that rushed for nearly 2,000 yards last season, and quarterback Garrett Haskins should give the Falcon offense the ability to throw the ball as well. Blue Valley West checks in at No. 3 in the preseason poll with a strong nucleus from last season’s state semifinal finish. The Jaguars must find a way to replace 26 seniors, including standout quarterback Ryan Ralston. Maize is one school where the quarterback question is answered. Connor Lungwitz returns to lead the Eagle offense after passing for nearly 2,000 yards and 28 touchdowns last season. The Eagles will need to develop experience and depth up front in order to get back to the playoffs. Finally, Kapaun Mt. Carmel checks in at No.5 in the poll after a successful run to the state semifinals a season ago. The Crusaders return junior quarterback Brock Monty and some size on the respective lines. Kapaun must replace a talented senior class to prove to the state they are now a consistent contender. As mentioned above, the biggest change in Kansas high school football this fall is the addition of an eighth classification with the split of Class 4A into Division I and Division II. Each of the two new divisions will include 32 teams vying for a spot in the state championship games to be held in Topeka and Salina, respectively. In Class 4A-I, Bishop Miege drops down from Class 5A where the Stags advanced to the state quarterfinals a season ago. Miege returns perhaps the state’s top quarterback in Kansas commit Ryan Willis and an experienced offensive line that returns four starters and a fifth FBS prospect. Come district time, the Stags will be battle-tested from their Eastern Kansas League schedule. Speaking of teams that will be tested during league play, Topeka Hayden begins the season ranked No. 2 but will battle through the Centennial League during the first six weeks. The Wildcats return 13 starters from last season’s state quarterfinal run including quarterback Jacob Head, tight end Marcus Meier, and all-state linebacker Derrick McGreevy. Hays is also down from Class 5A to the new 4A-I ranks. The Indians will be led by Kansas State commit Alex Delton at quarterback. Bo Black moved from Great Bend to Hays to take over after Ryan Cornelsen left to take the Hutchinson job. 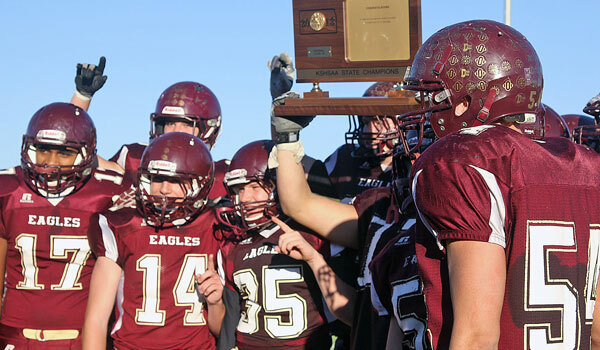 Defending champions Buhler checks in at No. 4 in our preseason poll. The Crusaders took a big hit to graduation including all-state back Riley Allen, but return a talented quarterback in Jace Williams. The Crusaders will be tested early, but should be able to compete for another playoff run. Finally, KC Piper’s recent run of playoff success looks to continue as the Pirates return 18 total starters from last season’s quarterfinals appearance. Piper has all 11 starters back on defense including linebacker Colton Beebe (6-3, 252) who is receiving interest from multiple FBS schools. In Class 4A-II, Andale and Holton begin the season No. 1 and No. 2 and are the front runners to meet for the title. Andale returns 12 starters from a run to the state quarterfinals that ended with a 24-14 loss to Holton. The Wildcats have several more holes to replace, but Holton has several big linemen awaiting their turn to lead the way for the wishbone attack. Speaking of experience, Columbus begins the season ranked third thanks to nine returning starters on each side of the ball. The Titans won the CNC League title a season ago, but fell in the first round of the playoffs to Independence. Holcomb begins the year ranked No. 4 in 4A-II. The Longhorns are now under the direction of former Goodland coach Kent Teeter, and return 16 starters to the field. Wamego rounds out the poll at No. 5 thanks to a veteran group that includes a 2,000-yard passer in Kyler Alderson. The Red Raiders finished 7-2 a season ago, but missed out on the playoffs after district losses to Holton and Topeka Hayden. Silver Lake is the only defending champion that begins the year on top of their respective poll. The Eagles won their eighth title last fall in record-setting fashion by blowing past Beloit, 82-38 in the title game. C.J. Hamilton’s group has some holes to fill, namely all-state signal-caller Dailin Kruger, but the pieces are there for another title run. They may not have to look far for their toughest challengers. Mid-East League rival Rossville is loaded with talent in Derick Hammes’ second season on the sidelines. The Bulldogs beat Silver Lake during the regular season, and return all-state quarterback Tucker Horak who accounted for more than 3,500 yards of total offense and 47 touchdowns a season ago. Traditional powers Conway Springs and Scott City begin the season ranked No. 3 and No. 4, respectively, and Galena fills out the 3A poll at No. 5. The Bulldogs return 10 starters on each side of the ball from a team that posted an 8-2 record a season ago. There will be a new champions in Class 2-1A this fall. Centralia dominated La Crosse 61-0 to win the state title last fall, but the Panthers have moved up to Class 3A this season. La Crosse returns a solid nucleus and looks to get back to Hays for a third time in four years, but this time, break through with a win and the school’s first football title. There will be plenty of challengers. Perennial playoff programs Sedgwick and Phillipsburg have dropped down from Class 3A and begin the season ranked No. 2 and No. 4, respectively. La Crosse’s opening week opponent, Olpe, is ranked No. 3 and returns several key players from a state quarterfinal run a year ago. Oakley rounds out the preseason poll at No. 5. Ty Pfannenstiel is the new Plainsmen coach and has the luxury of returning standouts Ryan Kuhn and Dylan Gassmann back from a defense that surrendered only 39 points all last season. Once again, it is the Madison Bulldogs who check in at No. 1 in the Kpreps preseason top five. Madison battled through an injury plagued 2013 season, falling 40-34 to eventual state champion Osborne in the first round. The Bulldogs return several key players including bruising running back Owen Reed (6-1, 230) who rushed for more than 1,600 yards and 22 scores. Hanover steps up to 8-Man, Division I this fall and does so with a roster built to compete for a title. The Wildcats advanced to the Division II state semifinals a season ago before falling to rival Baileyville B&B. Hanover returns seven starters on each side of the ball, including all-state lineman Ethan Fritschi (6-5, 245). Defending champion Osborne begins the season ranked No. 3 in Division I. The Bulldogs return all-state players in quarterback Jake Tiernan and wide out Brandt Wolters, but must replace their backfield duo of Maverick LeRock and Kenton Ubelaker. They Bulldogs welcome three transfer players in the offseason and look to compete for another deep playoff run. Osborne may be without coach Steve Tiernan for some time as he recovers from a late summer motorcycle accident. Central Plains checks in at No. 4 behind their dynamic offensive duo of Braedan Crites and Layne Bieberle. All Crites did is throw for more than 2,000 yards and 38 touchdowns as a sophomore a season ago, while Bieberle hauled in 1,048 receiving yards and 24 touchdowns. Finally, the Spearville Royal Lancers round out the poll at No. 5 and will get a Week 1 test against top-ranked Madison. Spearville returns seven starters on defense and all eight starters on offense from a team that finished 8-2 and lost 44-36 to Hoxie in the first round of the state playoffs. The 2013 season ended in storybook fashion as Baileyville B&B captured the Division II title in its final season. This season, the Division II field is wide open with several teams that appear evenly matched on paper. Thunder Ridge begins the season at No. 1 as the Longhorns return an experienced group up front and a back in Trent Rietzke with 2,000-yard potential. Victoria comes in at No.2 as the Knights return five starters on offense and six on defense from a season ago. Victoria’s younger players gained experience last fall after the Knights battled through several key injuries. Beloit St. John’s-Tipton checks in at No. 3 after advancing to the state semifinals a season ago. The Blujays return quarterback Trey Dubbert, but must find an answer to replace his top three receiving targets. All three teams atop the Division II poll will compete in the same district for two playoff spots. Chetopa begins the season ranked No. 4 and brings back plenty of talent with all-state running back Derrick Cassell. The Green Hornets also return 2,000-yard passer Philip Moses and welcome the addition of Pittsburg transfer Sherrick Rogers who could prove to be a difference maker. South Barber rounds out the poll at No. 5 as the Chieftains return two of 8-man’s best players in quarterback Peyton Yandel and back Dylan Allison.